Shortly after the foil-wrapped treats appeared in RAF ration packs, pilots began to notice that as altitude increased, the teacakes expanded. 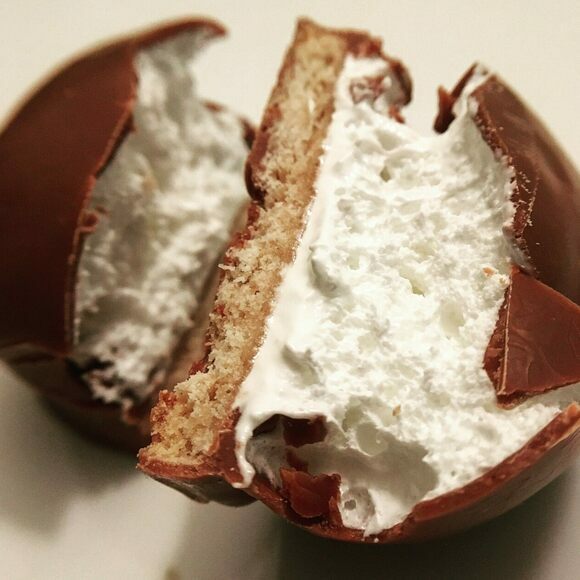 At 15,000 feet, the marshmallow interior cracked the chocolate shell. Air crews removed the teacakes from their silver foil packaging and perched them around the cabin for observation. The aerated marshmallow continued to swell as pressure changed, and the sweets became too big to eat in one bite. Many noted that, despite the extreme physical effects, the expansion didn’t compromise the taste. But the expanding teacakes’ fame was short-lived. After a period of marshmallow fever aboard the V-Bombers departing from Gaydon air base, an explosion put a stop to the fun. During the summer of 1965, a captain and student pilot forgot they had placed unwrapped teacakes above their instrument panels. When the captain pulled an emergency depressurizing switch during a training mission, the treats erupted. Shards of chocolate and marshmallow hit the windshield, flight controls, and the mens’ uniforms. Shortly thereafter, the RAF put marshmallows on their no-fly list. Decades later, The Telegraph recounted the incident with an article entitled “Deadly Teacakes.” Thankfully, no lives were lost in the explosion. While it's never been confirmed, it's likely the pilots' chocolate teacakes were Tunnock's, a still-popular brand in the United Kingdom. Under normal circumstances, they won't explode.